Each stem of a bird of paradise usually contains about 4 to 5 flowers (called inflorescence). Sometimes only one flower is visible, where others are hidden in another part of the flower. When one exposed flower withers it should be removed and another one can be pulled out of the flower’s boat shaped bract. If a flower doesn't emerge, gently ease it out by hand. 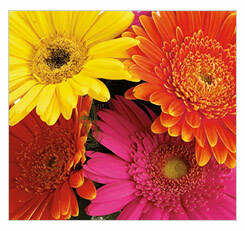 These exotic blooms are sensitive to temperatures below 50 degrees F, so display them in a warm spot. PEONIES- fragile, handle with care!